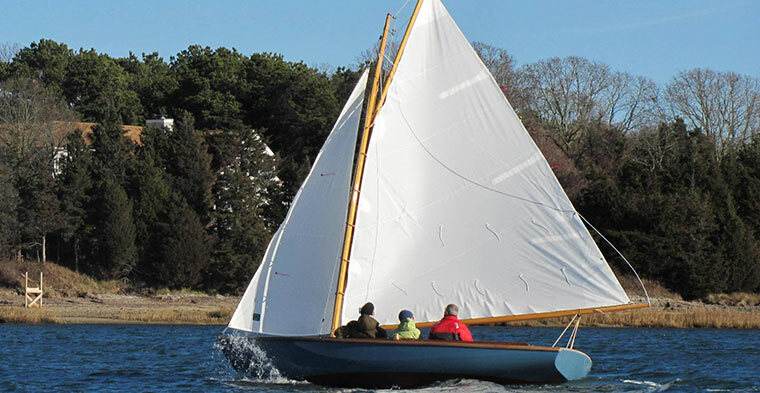 The Hurricane is the third design in our fleet of traditional gaffers, with a pedigree that still holds up today. In spite of the many transformations, the hull shape remains faithful to Carl Alberg’s original concept, with a focus on seaworthiness, comfort and stability. The original Alberg hull was purchased by Andrew Vavolotis in the late 1960’s and manufactured as the Cape Dory Typhoon. Of the nearly 2000 world-renowned Typhoons sold, it’s worth noting that only a hundred or so were built as the open cockpit versions. 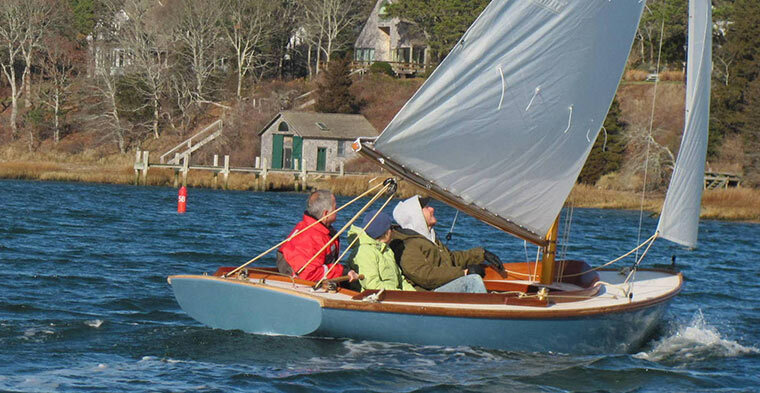 Nauset Marine of Cape Cod acquired the Typhoon mold in the mid-80s. 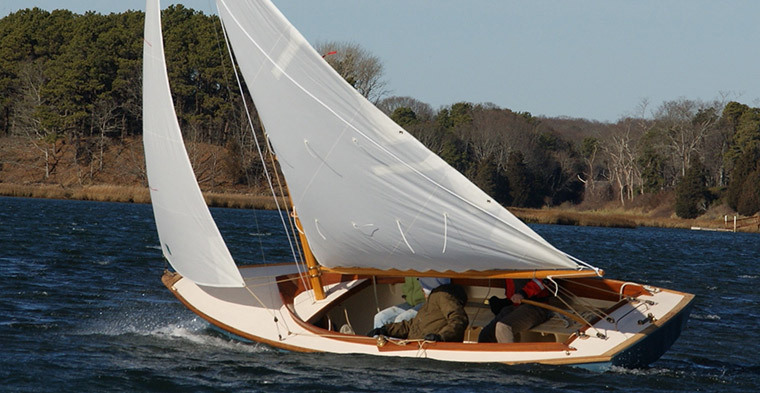 But it was years later, when Merv Hammatt of Compass Classic Yachts, brought new life to the design. 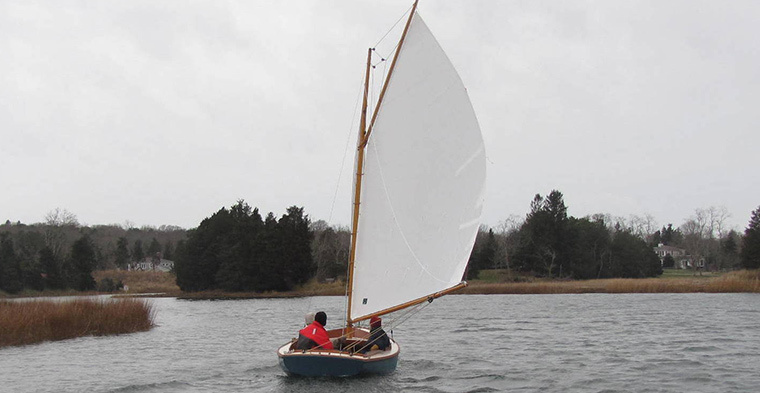 Hammatt made some modifications to the hull which transformed the Typhoon into the Hurricane, a keel/centerboarder with a lower freeboard and draft. The cockpit remained open and a gaff rig replaced the original Marconi main and jib. Only twelve were built before Hammatt retired, but that was in a three year period. There was some definite excitement about the Hurricane. 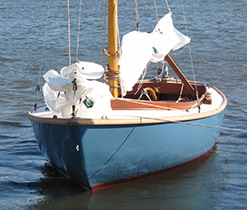 Pleasant Bay Boat and Spar’s Hurricane has many notable improvements, beginning with a new deck which is designed to fit the hull properly, simplifying construction. The angle of the coaming has been set to a comfortable camber. Hardware pads, non-skid patterns and beautiful clean lines complete the deck appearance. Our Hurricane is built to the same high standards that Cape Dory employed thirty years ago: a hand laid laminating schedule similar to that of a much larger yacht. The deck is cored with Divinycell, and the overlapping hull to deck joint glued with a semi-permanent polysulfide adhesive. The floors and bulkheads are made from a composite material made of glass enforced urethane and cut to the exact hull shape by a CNC router, then tabbed in place to the hull and deck. These additional construction steps result in a stiffer hull. Hands down, the rig is what stands out as the biggest improvement. Our gaff rig is the engine that drives this beauty. We consider it as important as the hull, and focus as much effort on the spars, rigging and sail as we do the construction and finish of the boat. Our spars bear our trademark Strong Island Spars logo with pride. 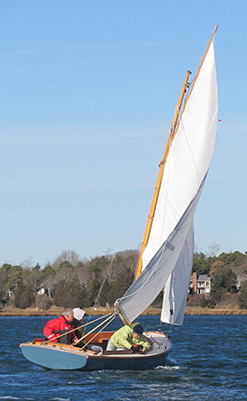 The standing and running rigging is made to order from the most modern materials available for a boat this size. The gaff rig itself is the only traditional part in this package; we have taken everything from cordage to hardware to another level in the search for function and form, safety and performance. The Typhoon was often described as a boat “that you could sail upright without scaring the life out of your family or friends”. The Hurricane has preserved that tradition. For us, the main focus is performance. We strive to build all our boats using the best materials in the most efficient way, in order to gain in performance while being safe. It starts with our hulls and doesn't end with our sails. Our innovations have to work and not just satisfactorily but superbly. Our goal is to create a safe, fun, easy-to-sail boat that offers years of sailing experiences for the whole family or the solo sailor. It is why we have focused on every detail from the centerboard to the halyard blocks aloft. How does the Hurricane Compare? 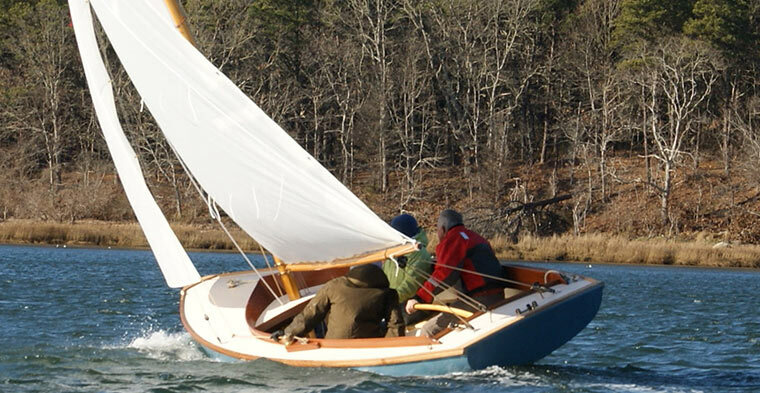 Many comparisons have been made with similar designs such as the Herreshoff 12-1/2. Take a second look and the differences will become apparent, beginning with the hull profile. We can compare the statistics (hull speed, sail area to displacement, displacement to length, etc.). The older full keeled Typhoon matches the H12 stats consistently. The Hurricane’s lighter displacement and slightly less sail area will naturally alter the comparison but not by much. On the plus side, the longer waterline and shallow draft will add to the performance and versatility, broadening the sailing possibilities without sacrificing stability. These are the key attributes that stand out for the Hurricane: a more intimate feel, less draft, and a responsive helm. 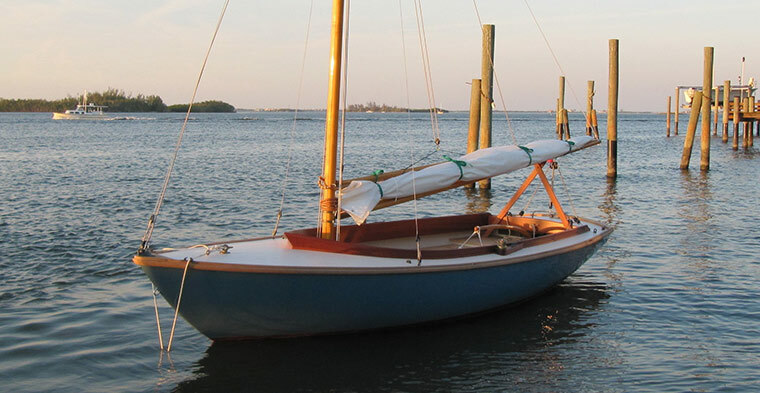 The Hurricane offers the solo sailor a wonderful, exhilarating ride without the white knuckles. The position of halyards and sheets for sail-handling is easily accessed. 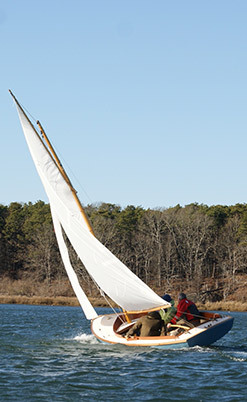 The sail comes with a jiffy reefing set-up which can be handled from the cockpit. The jib sheets are handled mid-cockpit. We offer Wilmex #8 winches as an option. The Typhoon had a very simple cockpit design which we found pleasing. The Hurricane’s open cockpit is roomy; six or more adults can feel comfortable and secure, nestled in the seats. 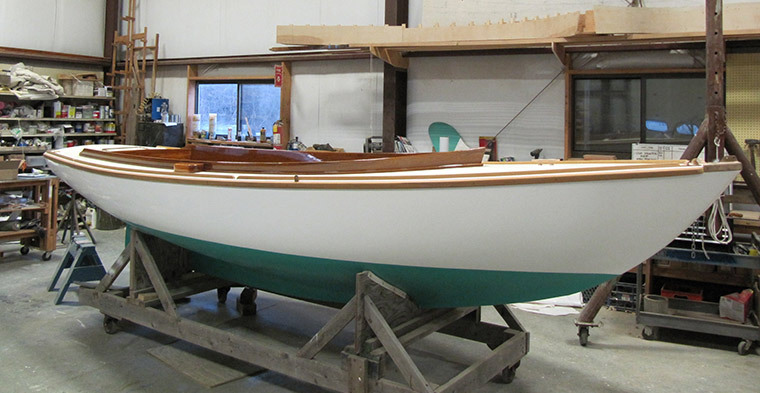 The coaming is set high enough to keep the skipper and crew safe and dry. There’s ample storage under the foredeck, in the anchor locker, and the aft bridge deck. Our cockpit sole has a step-down pan which allows for a more comfortable seat height. The coaming has been canted at the appropriate back angle and the seating is as comfortable as you would expect on a larger yacht. By fabricating the cockpit rather than installing a liner, essentially a pre-ordained layout offering little or no flexibility, we have built in the possibility of different seat configurations and trim materials. This option gives the owner some say in the layout depending on their needs or taste. 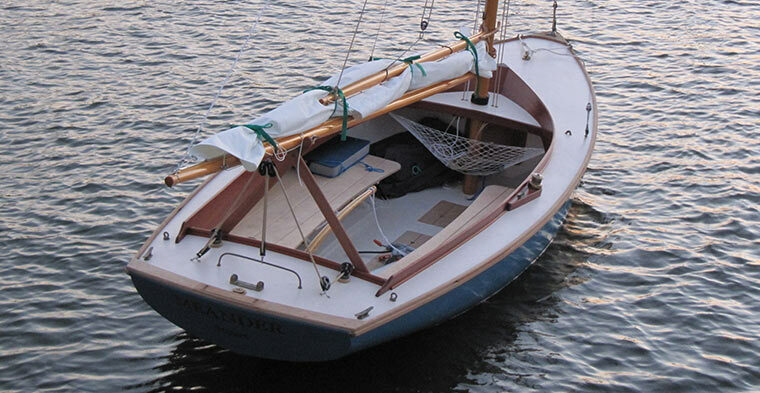 The standard coaming and seats are mahogany, but teak is available as an option. Toe and rub rails are always teak, left unfinished. The cockpit sole is also wood, either mahogany or teak, and beautifully cut to our unique pattern. The degree of finish is up to the owner: whether varnish or bare wood, we have carefully chosen the species and fabrication that will endure the weather. Our wood work is properly bedded and fastened. Epoxy adhesive is used for laminations. We recommend the degree of finish that suits the owner. While the Hurricane may perform like a yacht, she does not have to have the maintenance of one. Our goal is to get sailing, have fun and create lasting memories. Do I have to paint the bottom every season? Yes, you might as well. Do I have to varnish the spars every season? Absolutely. They are the engine, and likewise it would be similar to not changing the oil in your car. You may not notice it right away but eventually the damage will be done. The spars are your investment. See our Spar page for more information on our fabrication methods. Do I have to finish the woodwork every season? Not necessarily if it’s finished in a product like Sikkens Cetol, then you can skip a season. Varnish does need an annual maintenance coat, however. The sail should be kept clean, and folded and bagged dry (!) for the winter. In season, they should have a sail cover to protect the fabric from harmful UV rays. Lines should be rinsed at the end of the season, and then hung. 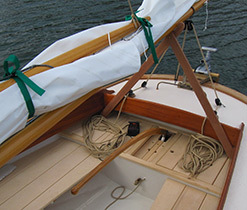 All halyards and sheets should be properly stowed for the winter. 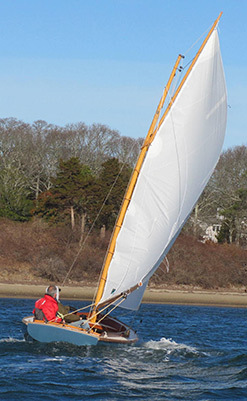 Can the Hurricane be Marconi rigged instead of gaff? It can be done with some modifications. Yes! We have had a spinnaker designed for the Hurricane.